Today’s defence-related news includes wide coverage of the RAF Tornado jets returning home from operations for the last time. Coverage appeared in The Mail, The Times, Star, Scotsman and Herald. The Telegraph front page featured an image of Wg Cdr James Heeps being greeted home by his wife. Reporting focused on this milestone for the aircrew, the lengthy history of the aircraft and the operational capabilities of the new Typhoons. It is with a heavy heart, but enormous pride, that we bid farewell to the Tornado from operations. This truly is the end of an era, having played a vital role in keeping Britain and its allies safe for four decades. But, after so long in service, it is only right that we now look to the future. The combination of our state-of-the art F35s and the Typhoon’s new weapon systems will keep us as a world leader in air combat for a generation. My sincerest congratulations to the Tornado Force, returning home after more than 4 years of continuous commitment to defeating Daesh in Iraq and Syria - an exceptional effort from everyone, well done and thank you. As a Tornado GR4 pilot myself, I have seen the aircraft develop over its nearly 40 years of service into an outstanding combat aircraft, flown, maintained and supported by similarly outstanding air and groundcrew. The Tornado Force has been continuously deployed on operations since 1990, serving with immense distinction in Iraq, Syria, Afghanistan, Libya and the Balkans. I will personally be very sad to see the Tornado retire, but it is time now to pass the baton to our next generation combat aircraft. The F-35B Lightning is now operational and the Typhoon is now fully multi-role capable and able to take on the Tornado’s missions. We can all take immense pride in what the Tornado has achieved in defence of the nation over nearly four decades, and reflect back on the courage, commitment and achievements of everyone who has contributed to the success of this extraordinary aircraft. 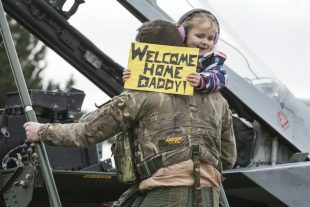 Image of Squadron Leader Bonning descending the steps of a Tornado aircraft whilst holding his daughter. Crown copyright.